How much can you expect to pay for a person to come to your location and officiate your wedding? What is a fair price ― a price that doesn’t seem like gross profiteering to you, and is a respectable wage to them? Over the years, I’ve had many conversations with people about the economics of officiating a lifecycle event. Most of these were about weddings in particular, but they have also happened around vow-renewal ceremonies, tombstone unveilings (a Jewish funeral tradition) and baby namings as well. Hmmm. Well, actually, it isn’t. And I’ll explain why. 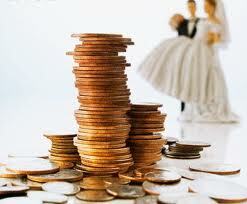 • How much does it cost to hire a wedding officiant in metro Philly (or the East Cost in general)? • How much should it cost? • Lastly, for the truly budget-bound, I’ll offer some even more frugal ideas. • What kind of a price do you expect to hear when asking for a price quote? • Is your expectation reasonable? • Do you believe a person engaged in a “religious” occupation should be taking a vow of poverty? • If you extrapolate out your price expectation, would the person be living in poverty? How you answer those questions might influence how you have, up until now, thought about the economics of the people you are hiring to complete various aspects of your wedding. In the state of Pennsylvania, you can get married for $90. Literally. Go to City Hall, request a “self-marrying license,” pay $90, wait three days (that’s a legal requirement), and then sign the license in the company of two adults. The witnesses will sign it too, and provide their addresses. Mail the license back to the court. You are married. People often express disbelief when I tell them this, but it is the honest to god’s truth. This is how I legally married. You can thank the Quakers for this; the state has very easy marriage laws because it was founded by a religious community that believed ardently against hierarchies. If I take one issue with the “wedding chapel” type businesses propped up around the state, it’s the fact that not one them ever admit this fact. As someone who worked in journalism for two decades, I’m a big believer in “full disclosure.” You can get married in Pennsylvania for under $100, and you don’t need anyone else to do it. So, if you really can’t afford a wedding, don’t have one. Use a Quaker s elf-marrying license, and go on a honeymoon instead! Now let’s assume you do want to have SOME kind of ceremony with either NO guests or even just a handful of guests. Now you have entered the realm of Option 2. To save money, you will want to get your license at a county courthouse (Montgomery County is the one I’m most familiar with) rather than at City Hall in downtown Philadelphia. Philadelphia County charges $100 for their license but Montgomery County only charges about $55. Other counties also offer lower rates. You can use a county license from any county in Pennsylvania anywhere else in Pennsylvania (as far as I know — you should always double check that at the courthouse!) In other words, bride and groom must go in person, to a courthouse somewhere in the state, pay the fee, show the right paperwork, and then use the license within the next few months, or it is voided. Once you have your license, you need a place to get married and someone who can sign it. You can hire a freelance minister / rabbi / chaplain who will meet you at your home, in a restaurant or in a park (etc) and hold a short, simple ceremony. The cost of this depends on whom you hire, how far you want them to travel, and how much time they are going to spend writing the kind of ceremony that is just right for you. (I’ll come back to this option later). But that option will not be as cheap as your next-lowest price alternative, which is to go to a place like the Philadelphia Wedding Chapel. They are located off City Avenue, about 20 minutes outside Center City, and their “standard package” is $375. They will recite a prewritten ceremony (just changing the names of the two people), between 10 am and 3 pm on Mondays through Thursdays, and limit the number of guests who may witness. However, their rock-bottom cheapest rate is $150. That ceremony is called their “elope” special and no guests are allowed. You are limited to the same times and days of the week. Now, I have not seen them do their work, so I cannot comment on the quality. Since no one is spending any time getting to know you or talk to you in advance, you probably do not have any say in what kind of readings they do, whether they use “God language” or not, and they certainly aren’t spending time sharing aspects of your love story, or who you are as individuals. They are simply a business I have found online, and there are probably other budget options like them out there. But I can help you calculate the math. Your total price for a basic legal wedding ceremony with no guests is the price of the license (which, remember, you got prior to the ceremony from a county courthouse for $50 to $95) + $150 at the wedding chapel = for a total of $200-$250. If you want this kind of simple “justice of the peace”-style of wedding but want to have a handful of guests and perhaps some champagne in a clean, attractive venue — and you still are okay with getting married at 1 pm on a Tuesday — your bare bones budget price is going to be $50 + $375 = for a total of $450. If all of this is still too “bare bones” for you, you have now entered the realm of standard wedding officiation – where you are hiring someone to come to your event, wherever that might be, and deliver a heartfelt, meaningful ceremony before you and your guests. You plan in advance (in person or by phone), and you secure the officiant’s commitment at the time and place you have chosen. I do see officiants sometimes advertise for this kind of ceremony for as low $350 for the officiant. 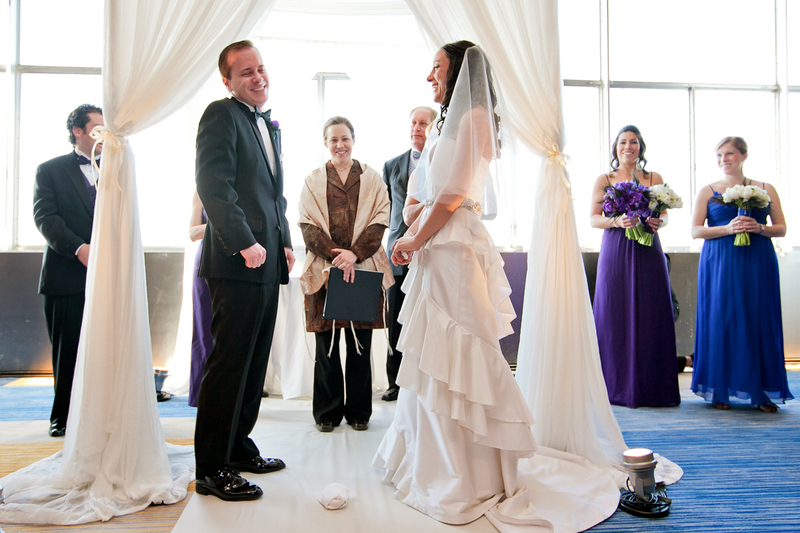 For that price, an officiant will not hold any pre-meetings in person, will not spend a lot of time getting to know you or writing a personalized “speech” or blessing for your ceremony, and is probably not traveling too great a distance to the venue site. However, one would hope they are still taking the time to customize a ceremony with readings, sentiments and God-language (or lack of God language) that matches who you are as people. (Again, one would hope). At that price, I can tell you that they are not really making a living at what they are doing. They are probably giving up a weekend or evening family time, they are probably spending most of what they earn covering the costs of online advertising, and they probably have some other vocation that is paying their bills. A more typical price range for what I will call a truly customized service is $800 to $1,500. Factors affecting the price are: who is offering the service, where the event is being held (travel time), and perhaps even what season it is. This is the price range you can expect for a full-on, traditional half-day wedding. (Oh wait, you say! I only want a ceremony that is 20 minutes long!) That’s fine … but it will, in the still, still basically be 10 to 15 hours of work for the officiant, from start to finish, to pull off your ceremony, and your wedding itself will probably book a venue for 5 hours of time. In this price range, you can expect to meet with the officiant beforehand. You and the officiant will communicate another half-dozen times shoring up details of your ceremony. The officiant will spend several hours on-site on the day of your wedding, plus however many hours traveling. If the distance traveled is more than a few hours, it would be customary for you to offer to pay the cost of a hotel room for the officiant. I know I’m always grateful when people hiring me extend this option; I don’t always accept, because I have small children at home, but I appreciate simply having it as an option. Couples also usually invite me to attend the reception. How officiants respond to this varies. Personally, unless I know the couple outside of this event, I usually decline. I’m touched and grateful that they have offered, but personally I feel like it’s a simple way for me to save the couple $100 by not going. Plus, couples are totally engulfed by people they have loved and often not seen for many years at their wedding receptions. It’s not a great time for me to try to get to know them anyway. If a couple really wants to have a more long-term relationship with me, I would suggest a fun outing with our families to Longwood Gardens or some other locale sometime after the event. • The officiant’s educational investment. As in all professions, people who have invested tens of thousands of dollars into their learning tend to charge more than someone who, for example, was ordained on the Internet. (And all the shades in between). This is why rabbis tend to charge more than ministers. Why? Two reasons. One, because the length of our education is often five or six years of full-time post-graduate coursework. Most Protestant programs take about two years. Priests don’t pay anything for their training and are guaranteed lifetime employment. Hiring a rabbi is akin to hiring someone with a doctorate degree. Second reason: Christian and Jewish communities are structured differently economically. Priests are paid salaries by a huge, wealthy, international corporation (the Vatican). Certain types of ministers are “appointed” to churches, which pay their salaries through a nonprofit, tax-free structure. Other types of ministers, as well as rabbis, are freelance agents who must constantly find work, negotiate and renegotiate their wages, and have no umbrella organization or nonprofit assuring they make a living. • The season. Why is this? Well, there are a LOT of weddings in the spring. If you are struggling with a budget, you can negotiate better prices among all your vendors if you schedule in the off-season. I’ve never gotten a call to do a wedding in February! I’ll give you a great price in February! (LOL). This spring, I got a call from someone pressing the price-panic button. I was very sympathetic until I learned their wedding was on a Saturday night in mid-May. I’m happy to give discounts to people in financial distress, but my Saturdays in May are going to be booked solid; can I really afford to take a huge cut in my usual fee when this means I will probably turn away another wedding that would have paid me full price? Especially when the wedding business (and hence my income stream,) is so erratic? If you’re hoping to negotiate with your vendors, think about your timing. November weddings are much easier to negotiate than June weddings. • Lastly, distance. If an officiant is traveling 4 hours to and from your wedding, versus 30 minutes, that’s a big difference. Not just in miles on a car and time in a day, but in my case at least, in the cost of child care! In my early years of officiating weddings, I actually lost money on several weddings because I failed to take travel time (and all its associated costs) into consideration. So if you aren’t hiring a ritual officiant for the legal aspects of getting married, why hire one at all? And how can you weigh a “good” one from a “bad” one? What you are paying for when you hire an officiant, is the skill, knowledge and heart of the person who is creating the ritual for you. Even if what you want is “very simple,” no officiant worth their own dignity is going to show up with some canned, pre-scripted script with just your names inserted inside. But alas, some people actually would. When I see people advertising a “customized” wedding ceremony for only $250, all I can think is: “Well, it must not be very customized.” It’s just not possible to write a customized wedding, spend 3-6 hours on the day of the wedding getting there, doing your job and getting back — and then charge $250! When you compare ads and officiants for weddings, we all use words like “customized,” but we don’t necessarily mean the same thing. Most people getting married think: “Oh, I don’t want anything fancy. It’s simple.” Well, it may be simple in how it looks on the outside, but in the details, there are a million different ways that I can stand up and marry two people. • Do you want someone standing up in front of your guests, quoting passages from the Old Testament and talking about the role of wife as a “helpmate”? If you do … that’s fine! But you don’t want to hire me. • How do you feel about the audience saying “amen”? • How “spiritual” do you like to get? Is it okay if your officiant wears a big bright hat and flowing robes? Or do you prefer a more demure or formal presentation? • Would you like your officiant to crack a few jokes, or do you think a wedding ritual should be more serious? • Does 10 minutes sound about right? Or more like about 20? Or even 30? 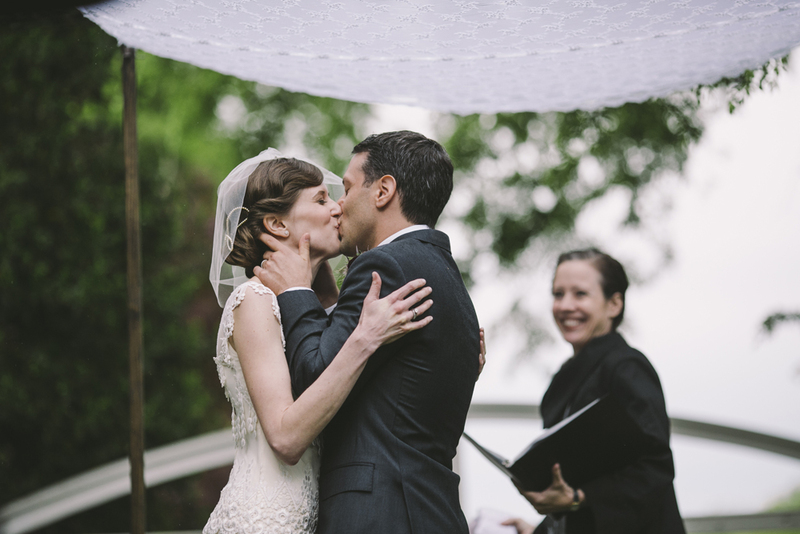 Does your officiant ask you what you want!? • Would you like a guest or two to come up and do a reading? • Do you want to write you own vows? Do you need guidance on writing them? Will the officiant offer it? Even though we wedding officiants DO recycle parts of ceremonies and readings here and there, there is no such thing as a “canned script.” At least not one that is going to do you or your guests any justice. Without spending at least some time talking to the officiant, explaining who you are as people and what your preferences are, we have no way of knowing what is the “right” thing to say. Beyond this ephemeral thing called “skill” you are paying for in an officiant, the other thing you are paying for is his or her time. * travel each way to the venue site, which often takes more time than the wedding ritual itself. In short, we are investing way more than the “20 minutes” presumed by that blogger on The Knot ― even for a “simpler” lower-budget wedding. We are investing many hours for that magical 20 minutes that looks easy and came off seamlessly. And hey, don’t knock the importance of “magic”. A wedding ritual should be magical, and it is worth way more (in my opinion) than having high-end napkins on the table, or having 2 buckets of flowers instead of one. One other thing to keep in mind: How many people you have in attendance at your wedding or vow renewal has virtually no impact on how much time we spend working for your wedding. 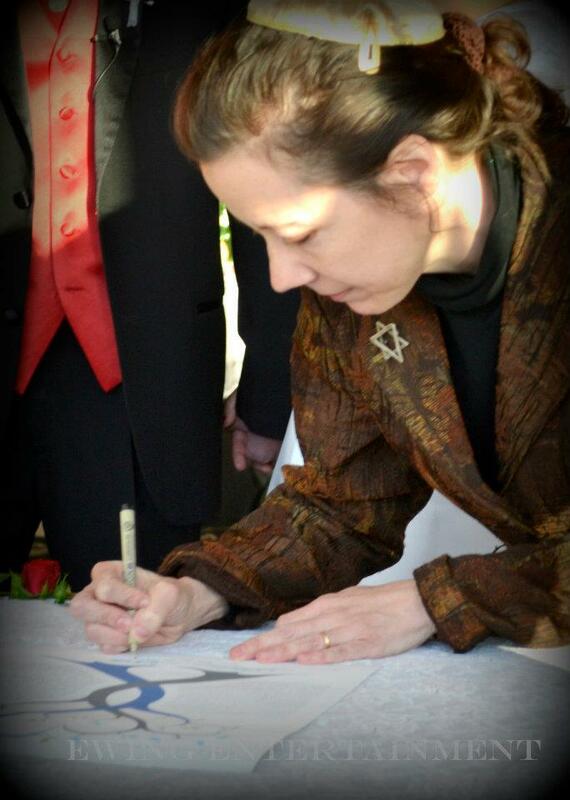 Caterers use a price based on head count, but for officiants, we factor based on time. The prices people quote you will be an indication of how much time, thought and energy they are planning to spend creating the ritual of your wedding. Is it okay with you if your officiant shows up five minutes before the ceremony, reads a canned script that takes under 10 minutes to declare you married, and then dodges out the door the minute it is over? If you are okay with that, then go for the $250 offer. But, if the ritual part of your wedding is more important to you than that; if you want to be more involved, have a choice of readings, perhaps even meet in person first; if you want your officiant to show up early and stick around a little bit afterward – you’ll need to anticipate a higher price. So just what kind of price quotes will you get in the officiant bidding process? Assuming your venue is within one hour of the officiant’s home, a typical price for a full-on wedding, with meetings, ketubahs and interfaith discussions (which take longer), I would be surprised by any price below $800. Some rabbis are willing to bend on their price (I am, depending on hardship, and depending on location). And again, a wedding in the low seasons of February or March are easier to down-negotiate. A full-on customized wedding in the months of May, June or September, a standard price would be $1200. 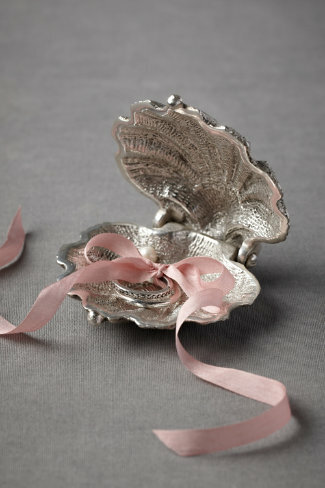 Lastly for very small home weddings, esp. 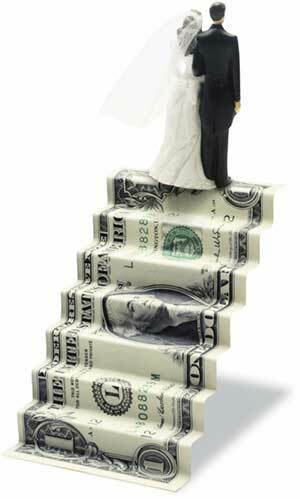 second marriages, with 10-15 guests, in a non-peak season, $600 is a fairly universal fee. For an elegant wedding at a low cost, try “historic.” The Old School Meetinghouse of Southampton, Bucks County, rents their facility at a low cost. You can still wear that cloud of white gown and walk down the aisle without breaking your budget. Any denomination is welcome at this facility. Mature trees surround the building and beautiful Tamanend Park is just across the road. Located at Second Street Pike and Maple Avenue in Southampton, PA. 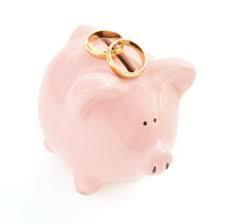 In addition to large formal weddings, they have budget packages for “just-marry-us” and “mini-wedding” services. Your article is quite right! As a civil celebrant in a nearby state, I am allowed by state law to charge no more than $50 for the actual performance of the ceremony plus mileage (other services such as attendance at rehearsal meetings, etc. are negotiable). Typically, my weddings are of two sorts: The first is the quickie: “We’re at the courthouse (or jail, or parked in front of your house) and want to get married today.” That’s hard to customize, I usually just ask “English or Spanish?” That’s $50. The second type is the traditional planned wedding. I meet with the couple for 1 or 2 hours, give them a ppt. presentation and give them a 25 page booklet with selections of vows, readings, etc. By email we jointly develop a ceremony suitable to them. Then if I am needed at rehearsal, I go to the site. Estimated hours for typical is about 8 – 10, for which a suitable total cost would be $300 ($50 + $250 additional service). I do over 200 weddings a year, and am not getting rich. For those who ask “How come it costs so much for 20 minutes work?” I suggest they ask the plumber how much it costs for him to fix a leak in 20 minutes on a Saturday night at your house. Then ask him to also come the night before to just practice fixing the leak! Then tell him to stick around for photos, and to fill out some state forms, and mail them on his way home. Oh, and tell him to wear a black suit and greet all the grandparents, and make sure his tie coordinates with the flowers. And get there an hour early to coordinate with the musicians. And by the way, would he greet the groom’s friends during the leak fixing in the Sicilian dialect of Italian? And would he mind wearing a microphone and holding a flashlight? Wow, friend, and I think you are SERIOUSLY underpaid for all you are doing.